If you were enchanted by these Snow White Isabella Fiore Handbags and Wallets, you are going to love Disney Store’s latest arm candy – Snow White jewelry. 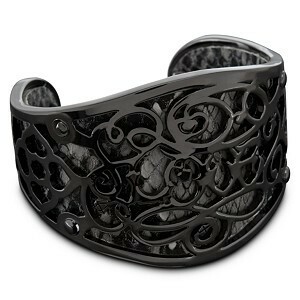 The black cuff caught my eye instantly! Give your jewelry collection some bite with this Snow White Bracelet featuring an apple and diamond shapes set within a filgree design. 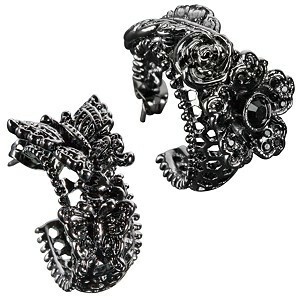 Cast in metal with a gun-metal finish, the design is backed with a faux snakeskin fabric for extra bite. 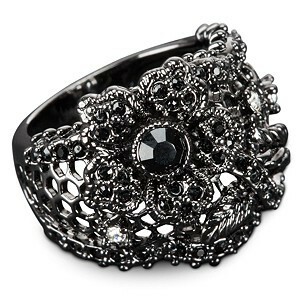 A fine lace design sparkles with black and clear jewels on this Snow White Ring. Its shiny gun metal finish adds an elegant luster to this piece of jewelry inspired by Disney’s classic Snow White and the Seven Dwarfs. 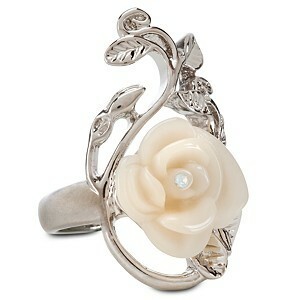 Your jewelry collection will blossom with the addition of this Rose Snow White Ring. Silver leaves wind around a pretty white rose on this elegant metal ring inspired by Disney’s classic Snow White and the Seven Dwarfs. 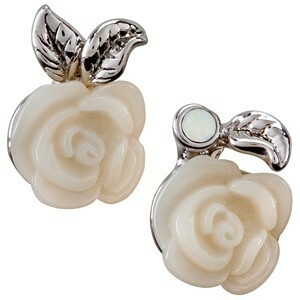 Your jewelry collection will blossom with the addition of these of Rose Snow White Earrings. Two pretty white roses are accented with silver leafs, one featuring a white jewel accent on earrings inspired by Snow White and the Seven Dwarfs. This pair of ornate Snow White Earrings feature two distinct designs. Two butterflies alight on the honeycomb base of one, whiile the other features a flower and leaf design. Together they become striking Snow White and the Seven Dwarfs jewelry.